As a side dish for the past few years, I have made roasted asparagus a la Ina Garten, who quite frankly is the best host on Food Network, followed by Ree Drummond. I think Ina’s great, and here is her recipe for roasted asparagus. Trim the bottom of the asparagus. Place on a baking sheet, drizzle with extra virgin olive oil and roll the asparagus around to cover all sides in the oil. Sprinkle kosher salt and freshly ground black pepper on the asparagus, toss again and place in a 400 degree F. oven for about 25-30 minutes, turning once so they don’t burn. 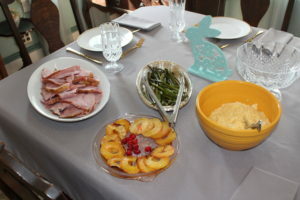 Easter 2018 meal-roasted ham and the carmelized fruits, cheesy garlicy mashed potoatoes and Ina Garten’s roasted asparagus.